Squash House Quilts: Holy Grape! Mr. Squash and I have spent several days in the garden doing some more spring planting. I decided to take a closer look at our grapes and see how they were doing. This is their third summer and I was really hoping to finally get some grapes. Click on the photo above and you'll see the little grape clusters just beginning to form at the top of the lowest set of leaves! I am just totally thrilled, to say the least! This is a white table grape. 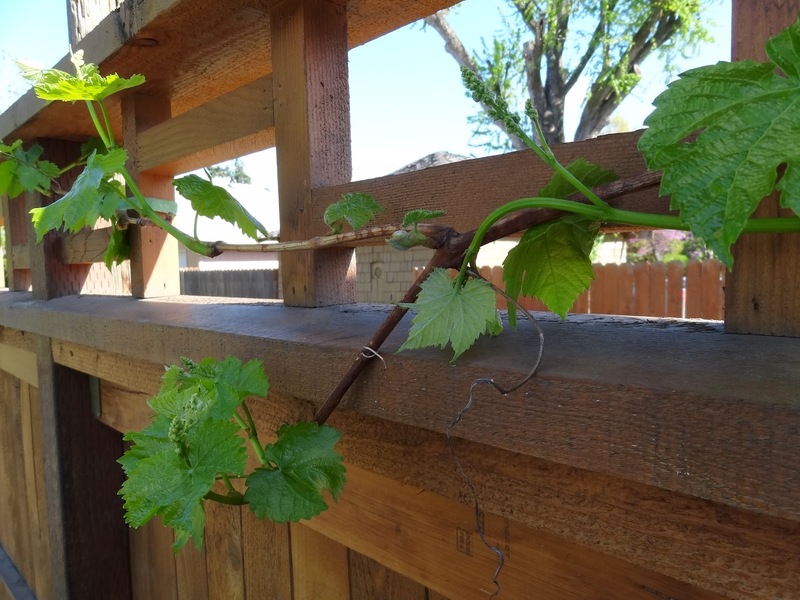 On the other side the red table grapes are a bit behind but coming on strong. In another few days I expect to see little clusters forming there, too. Saturday we went to a small nursery in town for the first time. It was a darling spot that also had an Italian deli and a wonderful little gift shop. 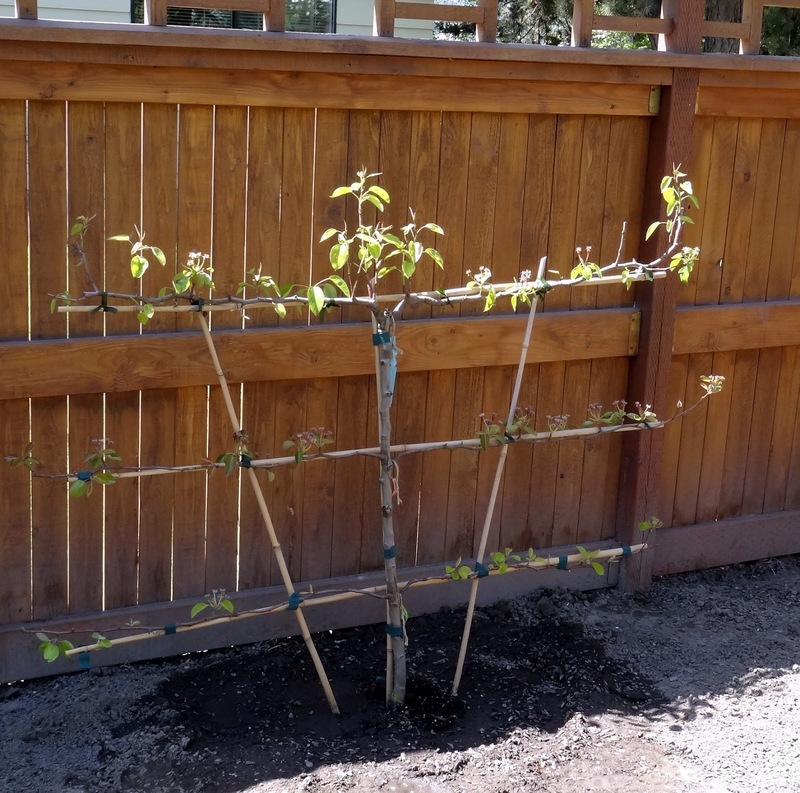 Right out front we saw this espaliered pear tree and had to have it! The owner delivered it for us later in the day. Each row has a different kind of pear - Bartlett, Red Bartlett and Bosc - and there are already pears on it! The nursery owner walked around our yard and gave his stamp of approval which made us feel terrific! Yesterday we planted some more veggies. Here are Mr. 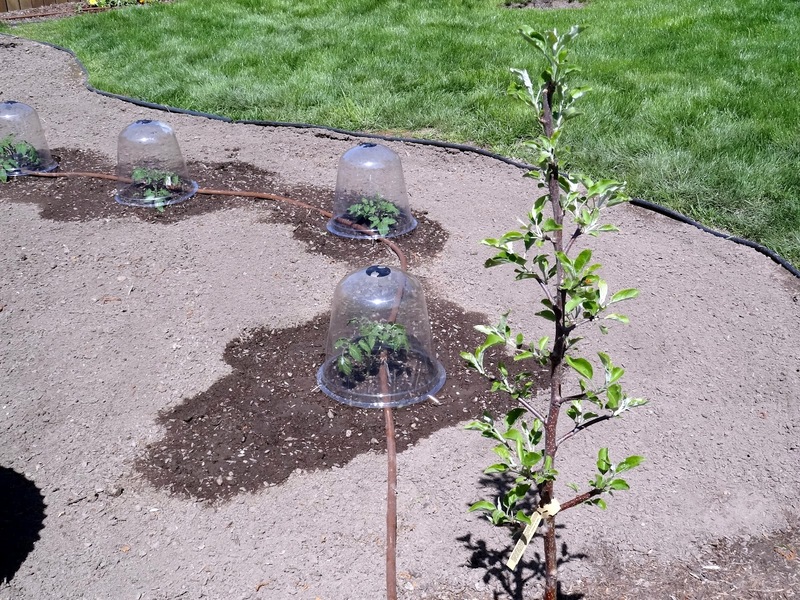 Squash's tomatoes - under cloches for protection from the cool evenings for now. In the foreground is our newest little dwarf Ginger Gold apple tree. It went from a bare-root tree with nubs for branches to this in under a month! Doesn't the Saxifrage looks so pretty right now? 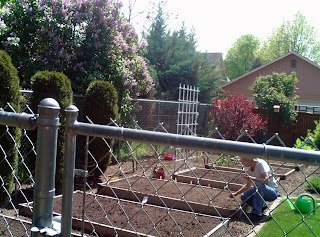 The large perennial bed is coming along, too. I can't believe how fast things are growing. Here is what I did most of yesterday morning. I am crouched down planting teeny, tiny carrot seeds. Oh, my aching back! But the beauty of an aching back is seeing Mr. Squash come along behind me and sweep the edges of the beds and make everything nice and neat! Gotta love him even more for this! Check out the incredible lilac next door! The smell at that end of the yard is out of this world! I'll leave you today with a photo of one of our four, 60 year old white Dogwood trees. Isn't it just gorgeous? 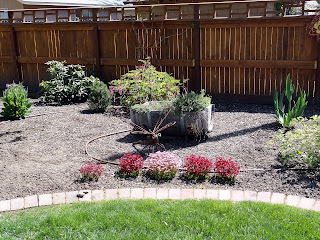 The Spirea hedge in front will soon be awash in little white blooms, too. 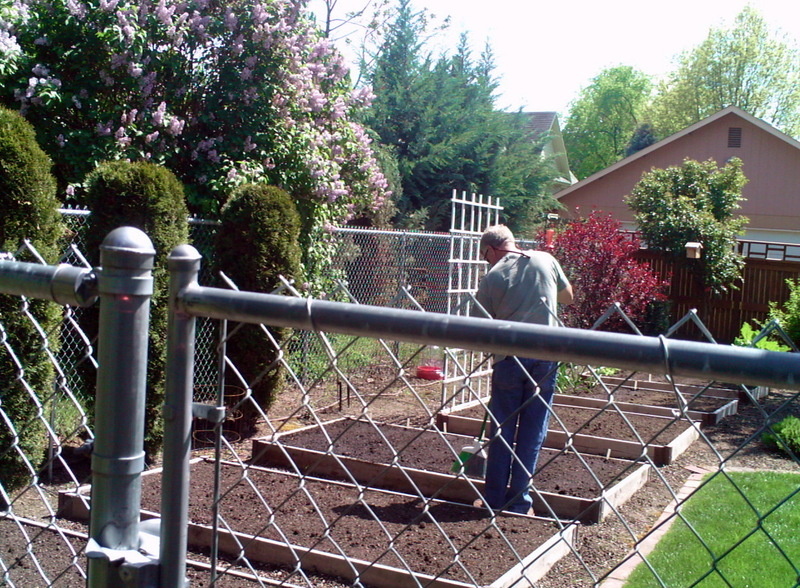 You will have a bounty of veggies and fruit to harvest this summer. Beautiful dogwood; nothing says spring like lilacs in bloom. I can smell them now. Looks beautiful. Enjoy watching it all grow and enjoy the Pendleton Quilt show this weekend. Cathy is my friends name and her booth is Wild Hare Fiber! Your garden is really going to have a bountiful year. We should get some warmer temps and winter was pretty mild. Its nice to have the older trees and your younger plants. Your new place is wonderful. I'm amazed its been 3 years. 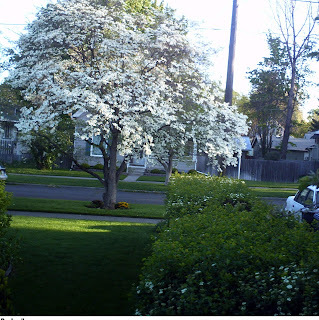 Your Yard is just gorgeous and I just love your Dogwood tree ! You are going to have lots of wonderful vegetables to enjoy this year ! Very exciting things going on in your garden! You and Mr. Squash will be very very busy over the next five months tending all your bounty. 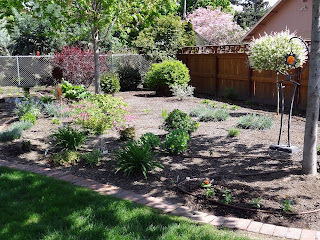 Love the espaliered pear and all the pretty dogwoods. You guys have quite the operation going!! It's so organized and pristine! You could have a garden magazine come out and do a spread on you guys!! I can't believe how big your Bleeding Heart is!! Gorgeous!! Mine took a little beating with our unseasonably warm to then cold weather. The Squashes could open their own nursery! Your yard is gorgeous and obviously well loved. The dogwood is spectacular. Before you know it you'll be munching on your grapes! Your yard looks wonderful! My DH planted grapes and raspberries this year for the first time. Oh, fun! won't be long before you see little green sprouts coming up. Where did you find those cloches? I need some of those. Your garden would give Eden a run for it's money for sure, Candace. Simply gorgeous and soon both you and Mr. Squash will be enjoying the fruits...and veggies too...of your labor. Everything is so gorgeous! I'm seriously thinking of getting a lilac bush. The next-door neighbors in Albuquerque had one in their back yard, and in the evenings, with our sliding glass door open, the scent just filled the den. It was heavenly. We are startting to get lilacs here. Gorgeous smell! I hadn't seen a multi variety grafted espellier before. Great idea and they will hopefully cross polinate one another. 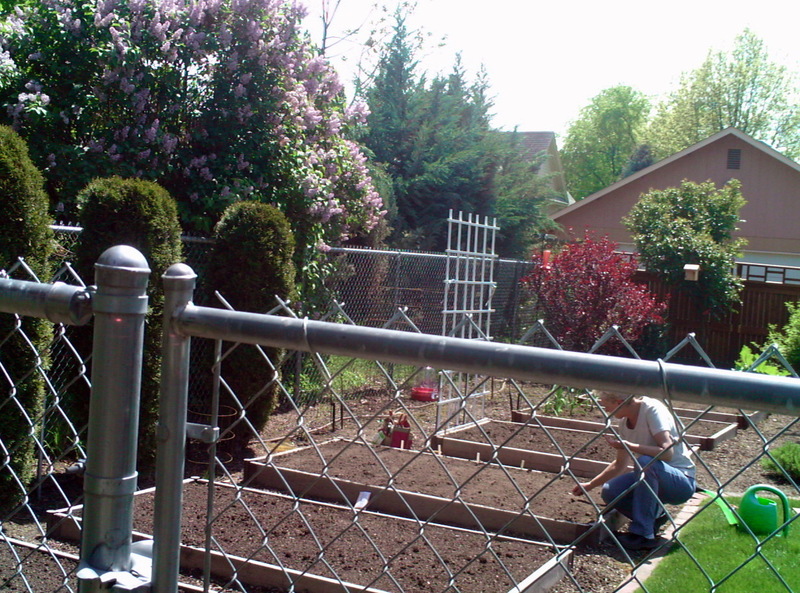 Yes your garden is looking gorgeous already. I can just imagine it in a few years time when it is more established. You are right. 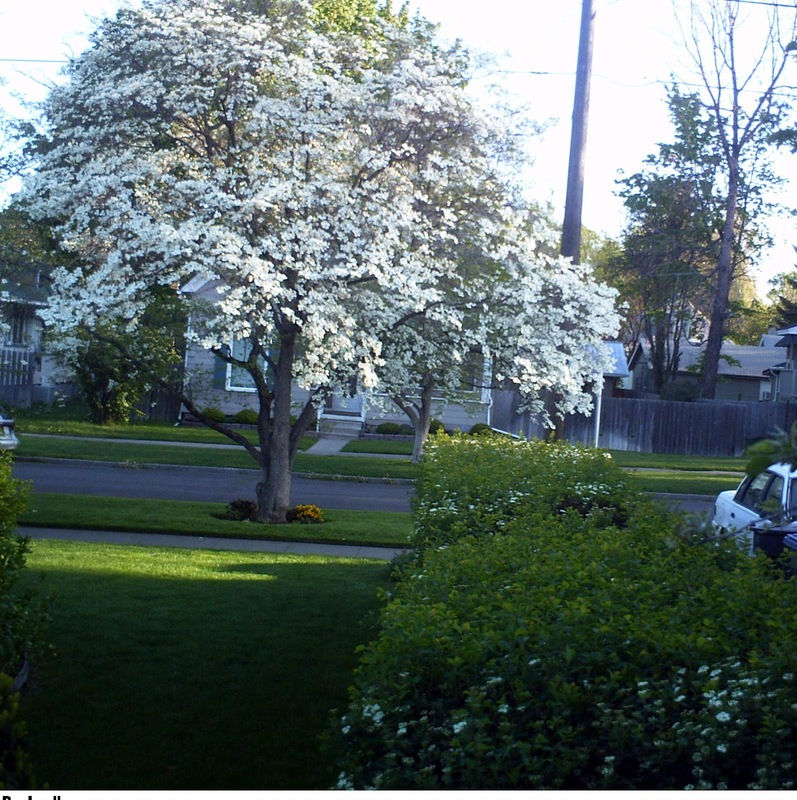 That gorgeous dogwood tree looks magnificent. 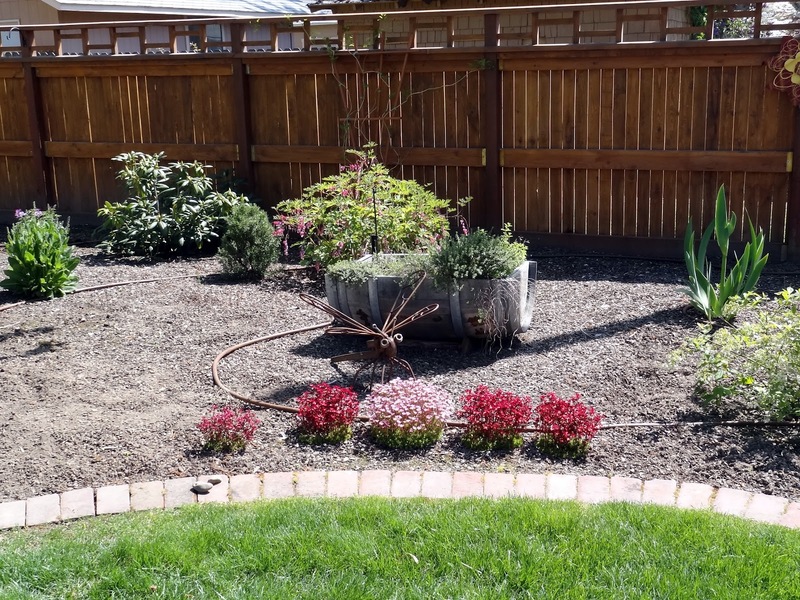 Beautiful yard you have! We're still waiting for winter to dissipate in Alberta. All in good time! I need to go down and check on my grape vines. Ryan trimmed them way way back this year, so we may not get such a big crop until next year. It is so nice having a winemaker in the family! Your garden is lovely. Beautiful and calming, like a sanctuary!